Advertising: an area with many different aspects and meanings. What is adequate advertising and how do we get the attention of potential customers for a product or service? Successful advertising usually consists of only a few words, effective and clear messages and a powerful visual element (image). Blending these elements into a convincing statement is the key to a positive outcome of a thriving ad. 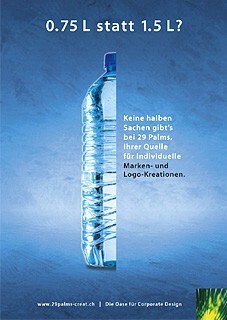 29 Palms helps you to sell your services or products with refreshing concepts and simplicity, whether it is a stark ad or an entire print- campaign. The oasis awaits you. Ad campaign "No things by halves"